Who couldn’t use a little more counter space? 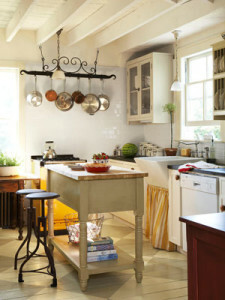 Kitchen islands are a wonderful centerpiece for more storage, prep room, seating, and counter space. 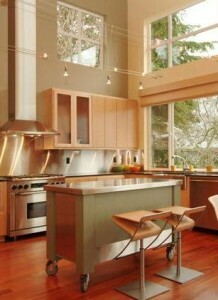 Kitchen islands can be the focal point of the entertaining area and the gathering place for creating family memories. Our island does not have a sink or cook top and personally I’m glad it doesn’t Having all the counter top space in the middle of the room allows for a fabulous nucleus to set for buffets, which is pretty much the way our family eats now. If you live in a small apartment you don’t have room for a big country kitchen, but that doesn’t mean you have to give up your dream of having a kitchen island…maybe just shrink them a little. Any extra counter space in a small kitchen is welcome. 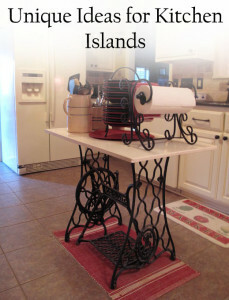 Think about a small stand-alone island. And maybe the piece you choose isn’t even meant to be an island. I think it is so fun to re-purpose furniture and it definitely adds some interest to your décor. If you’re into the industrial look how about a tool chest on casters. Make a top for it or buy a “second” at a cabinet shop and there you go! Think about this; re-purposing a bedroom dresser by making a counter top for it and dressing up the “back” (or front) with some molding or adding a couple newel posts, paint it a cool color and what a great kitchen island! Think of all the drawer space you normally don’t get in a regular island. Think of your island as another piece of furniture and it will open up your mind to all sorts of unique possibilities.